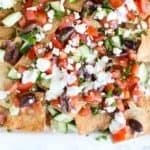 These vegetarian Greek nachos are perfect for a party or tailgate! Chopped veggies, salty feta, and a creamy tzatziki sauce make this easy pita chip appetizer irresistible! Spread the pita chips on a large plate or serving tray. In a small bowl, mix together the Greek yogurt, olive oil, and lemon juice. Sprinkle the tomatoes, cucumber, red onion, feta, and olives evenly over the pita chips. Use a spoon to lightly drizzle the Greek yogurt mixture on top. Serve immediately. The pita chips will soften quickly, so you should serve this dish right away. See below for substitution ideas!